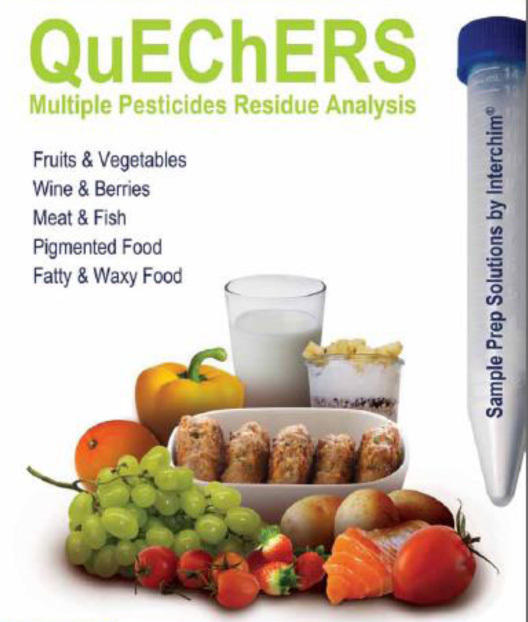 Interchim has introduced its revolutionary QuEChERS extraction kits that enable chemists working on various trace analyses such as pesticide residue analysis in different matrices , acrylamide analysis in foods, etc. Kits are offered in compliance to standard methods such as EN15662, AOAC 2007.01 etc. Bulk purification tube kits are designed with 15ml or 2ml tubes depending on the composition of the sorbents mix. All Interchim®QuEChERS kits are made from ultra-pure sorbents,high purity grade PP tubes and manufactured in-house under highly controlled rigorous processes. Each product batch is subjected to tight quality control checks and is delivered with a QA/QC certificate. Magnesium Sulfate (MgSO4): eliminates H2O traces and enhances the homogenization of the sample which allows a better treatment of the organic extract. Interchim have also developed QuEChERS Dual Phase columns (Carbon/PSA) for clean-up of pigmented extracts. The carbon layer removes pigment while the Primary Secondary Amine (PSA) layer extracts fatty acids. Interchim®Carbon + QuEChERS columns have been developed to remove polar impurities and pigments without loss of pesticides.